Cecilia Schiller was first attracted to woodcarving many years ago to create puppets and masks for theatrical productions. She soon found herself captivated by the process and began exploring carving’s many styles and forms. After seven years of study in the European style of Relief Carving she traveled to Bali, Indonesia and learned to carve masks using her feet to secure the wood while carving with specialized knives, gauges and axes. 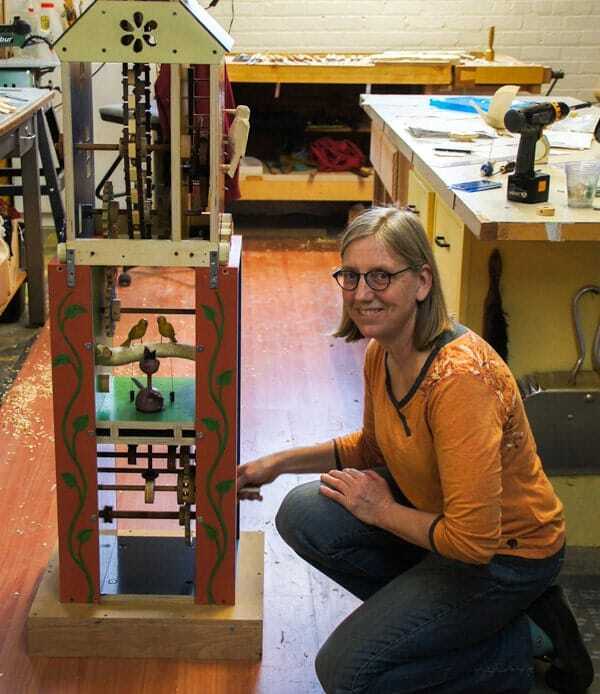 Cecilia has been awarded several grants including a 2014 Minnesota State Arts Board Artist Initiative grantee to facilitate her design process with computer aided design. The grant year culminated with "All Geared Up: Artwork that Moves" in the north gallery at Landmark Center January, 2015. A 2013 Forecast Public Art Project grant together with funding from the Ramsey Washington Metro Watershed District produced Water is Life, an interactive, water-driven sculpture installed in a rain garden outside an entrance to Maplewood Mall. Cecilia was featured on TPT’s program MN Original in early January 2013, a show that showcases Minnesota artists and their work. The show was filmed as she finished work on Birdhouse which was part of her Artist Initiative Grant project. You can see her story and view the full episode at www.mnoriginal.org. In addition Cecilia is available for custom woodcarving, design, consulting and teaching. Look for her scheduled classes at Woodcraft in Minneapolis and at Northhouse Craft School in Grand Marais, MN.